When it comes to vehicle segments, size matters. Or at least the perception that size matters, particularly in marketing terms, when agitating the already blurry line between medium and large cars, and the impact on suitability as family-moving devices. 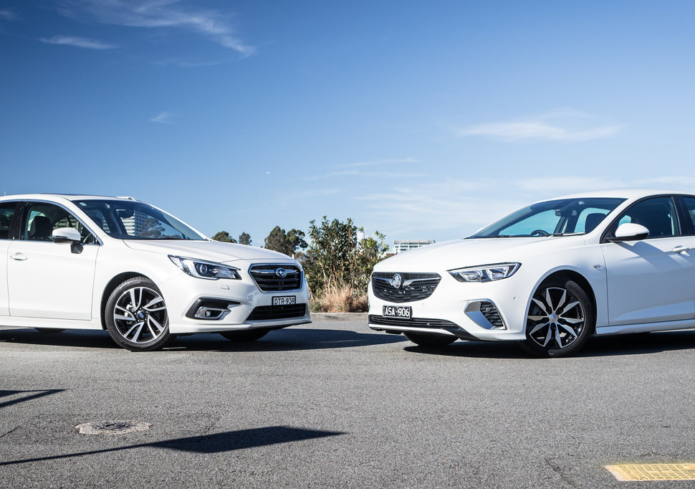 In Holden’s case, pigeonholing the Commodore as ‘large’ guarantees best-selling status in the segment, by a huge margin, even if technically its non-premium rivals these days number just two: Kia Stinger and Skoda Superb. A funny thing happens when you whip out the measuring tape on so-called medium and large sedans and liftbacks. You could, for instance, arrange the aforementioned Liberty, Stinger, Sonata, Superb, Mazda 6, Commodore and Camry from shortest to longest, only to become somewhat surprised to discover that’s the exact sequence of cars you’d arrive at by length. That’s right: ‘medium’ and ‘large’ labels don’t necessarily correlate with actual size. Sure, the 2018 Holden Commodore RS 2.0 FWD Liftback is, at 4897mm, almost 10cm longer than the recently updated 2018 Subaru Liberty 2.5i Premium sedan (4800mm). But parked up next to each other, they’re clearly lobbing similar pitches towards value-conscious buyers with more traditional (non-SUV) family-hauling tastes, and anchored that much harder when you consider that only a few hundred bucks separate the pair in the tussle for your hard-earned. Of the two, at $36,640 list, the Liberty is marginally more affordable off the showroom floor. At $6400 above the entry 2.5i version, the Premium sits in the middle of the three-rung Liberty range as the variant with the small four-cylinder engine, but laden with most (but not all) of the full-fruity goodness available on the flagship six-cylinder 3.6R ($43,410). At $37,290 list, the Commodore wants for an extra $650 above the Liberty, but the RS 2.0 front-driver sits third up from the bottom of a broad range of nine different Commodore Liftback variants (not counting a further choice of six wagons). Like its Subaru rival, it’s fitted with the entry-level four-cylinder engine in lieu of six-cylinder power on higher-spec variants. In terms of trim level, the Commodore RS is one rung up from the basic LT and shorter on equipment than more luxurious RS V, VXR and Calais stock, so the equipment list is a solid base-coverer: 18-inch wheels, 7.0-inch touchscreen infotainment, CarPlay/Android Auto, cruise control, a mix of cloth and partial ‘leather look’ trim and rain-sensing wipers. The Liberty Premium has the Holden comprehensively covered while adding active cornering LED headlights with automatic high-beam, leather trim with seat heating, a larger 8.0-inch touchscreen, paddle-shifters and adaptive functionality to the cruise control. There are no parking sensors, but you get surround view and, unlike the Commodore, you also get a proprietary sat-nav system. There’s also no extra cost from premium-type paint in the Subaru, while Holden charges an extra $550. Safety credentials are impressive across both cars, each featuring AEB, brake assist, forward collision warning, lane departure warning, active lane-keep assistance and rear-cross traffic alert. Both cars come with five-star ANCAP safety ratings. Design-wise, each sedan’s cabin clings to its maker’s heritage while attempting, though not necessarily succeeding, to appear rich and contemporary. The Holden’s awash in waves and curves, formed hard rubberized and mostly plastic surfaces that are cheap in places – centre console, steering wheel, lower door cards – but splashes around formulaic gloss black, chrome, some out-of-place carbon fibre and double-stitching to lift its presentation. The Subaru is more convincingly upmarket, if by a slight degree, with softer-touch door trim contact points and more tactile satin-finish and grain-textured plastics. The infotainment is large, clear and colourful, has decent proprietary sat-nav, though both the full-colour driver’s screen and the button arrays are a bit old-hat. The steering wheel, though, is a bit of a dog’s breakfast: a nice palm-friendly rim met with ridiculously fat spoke festooned with no fewer than 17 buttons, not counting the pointless paddle-shifters. Above and in all photo groups: Holden Commodore top, Subaru Liberty bottom. Bar the iffy multi-control indicator stalk, the Commodore’s a pared-back, straightforward array of features: switches and buttons that look carried over from other Holdens, and infotainment that looks tiny and lacking much in the way of features. Like the Subaru, you do get Apple CarPlay/Android Auto connectivity, bringing with it navigation by way of your smartphone, though this remains a compromised solution rather than proprietary sat-nav in a nation where comprehensive mobile coverage remains a pipedream. There’s just a single 12V and USB outlet up front, and a pair of powered USB sockets below the air vents in the back of the console for rear occupants, together with a silly asymmetrical console seemingly intent on denying the front passenger access to cupholders and air-con controls. Meanwhile, the Subaru adds an extra USB up front – its pair in a handy phone bin with closing lid – as well as an auxiliary port. The Commodore’s front sports seats are excellent, a keen blend of comfort and support, and nicely finished if in mostly tactile yet hard-wearing cloth trim. There are six switches on the flat-bottom steering wheel with nicely contoured rim profile and, thankfully, no try-hard paddle-shifters owners will surely never use. There’s little joy to be found in a basic instrument cluster and 1980s-look driver’s screen, though it’s all quite clear and legible. Both front seats in the Subaru are electric (the Holden’s passenger seat is mechanical adjust) and feature decent leather trim, though they’re not nearly as shapely, comfortable or supportive as the Holden seats. You do, however, get three-level seat heating. But the big revelation precious little separates the mid-size Subaru from the large Holden in cabin space becomes apparent in the second row. In fact, in row two it’s the Commodore that’s more claustrophobic, if merely because it has more limited head room. That said, the Liberty’s top grab handles do come close to passengers’ heads. Shoulder and knee room are equally generous in either car, and the Holden only a slight edge in elbow room, though their swooping roof lines will have adults craning their heads on entry and egress. There’s more bucketing effect in the Holden’s row-two outboard seating and more inherent long-haul comfort than in the flat-back Subaru, where you really need to hang on during cornering. That said, the Commodore’s cramped middle position makes for awkward and preferably short-trip accommodation, putting paid to any reasonable claim that the large segment car (of the pair) makes for a fitter and proper five-seater. In terms of boot space, the Subaru milks a scant three-litre advantage (493L against 490L) with the rear seats in play. But while the Subaru sedan’s 60:40-split-fold seating does allow ample load-through convenience, the liftback design affords the Commodore’s square, deep luggage area more usable height once the parcel shelf is detached and its 40:60-split seatbacks are stowed. Slightly more practical for the Ikea run, then. This pair couldn’t be more different in how they generate outputs and ply them into forward motion, and it all starts with the engines. At 2.5 litres, the Subaru’s flat-four is the larger of this pair in capacity, though it lacks torque-inducing forced induction and produces a modest 129kW and 235Nm as the Liberty range’s base petrol engine. The Holden’s smaller-if-turbocharged 2.0-litre straight four is the Commodore’s basic engine, yet it presents a measurably more potent 191kW and 350Nm – in fact, these are identical outputs to the high-spec 3.6-litre boxer that Subaru fits in the Liberty 3.6R, some $6500 pricier than the 2.0 Premium variant on test here. That said, one benefit of the Japanese car’s natural aspiration is that it runs on 91RON fuel – the Holden requires the pricier 95RON stuff. Backing the Commodore’s lustier engine is a nine-speed automatic and drive to the front wheels, whereas the Liberty uses a continuously variable transmission that produces faux ‘gear changes’ to remove typical CVT ‘elastic band’ powertrain sensations, and plies trade through all four wheels. You can have all-wheel drive in your Holden, but it sets you back an extra $3500, meaning that the Commodore leverages its advantage in engine prowess, the Liberty pulls its trump card further down the powertrain line. From the get-go, the Holden presents the quieter and more refined package. The Liberty’s boxer is louder, sounds more mechanical and, as something of a signature Subaru trait, revs annoyingly high (around 1800rpm) on cold start-up. On the move, around town, the Commodore has the advantage all the way. It’s more responsive to incremental throttle inputs and more linear, whereas the Liberty has a peaky ‘lunge’ on initial take-up, without much in the way of torque to back it up once you plunge the right foot further. Both cars are brisk enough to move swiftly with traffic, but it’s only the Holden offering the kind of certifiable punch you need for overtaking, plugging gaps in traffic, to swiftly merge onto motorways or to exit assertively from side streets. While the Subaru’s initial toey-ness ‘suggests’ meat underfoot, it fails to deliver genuine thrust once you dig deeper. Not only does the Commodore dole out more tangible performance, it’s less stressed at a cruise. Both are suitably refined and quiet at the constant throttle, but the turbo Holden’s effortlessness from its smoother engine and more seamless transmission translates into a more premium experience. The Subaru’s CVT is quite decent – it has improved markedly over the years – though the faked up-shifts, conspicuous by design, only partially mask what remains evident powertrain elasticity. The Liberty’s all-wheel drive brings with it a certain peace of mind, though on the balance of normal driving situations, any actual benefit over the Commodore’s front-drive arrangement is non-existent. Frankly, the Subaru engine’s lowly torque isn’t assertive enough to produce dynamic all-paw advantage outside of particularly slippery situations such as black ice or standing water. Neither are sports cars or particularly adept in dynamic agility, yet both offer decent all-weather grip, and safe and predictable handling. Both cars sit on 18s and, ride-wise, the Commodore is firmer if nicely compliant, settling nicely after absorbing speed humps and potholes, which it does without noise or fanfare. The Liberty is much more softly set and its more cushioning character alone will offer huge appeal to some buyers, though there are caveats: it wallows and takes longer to settle over big bumps, and it starts to feel a bit boaty once you load up four adults and luggage. Of the two, the Commodore has the lighter and clearer steering, though there’s not much in it on the move. During three-point turns and when parking, though, the Subaru’s direction finder becomes unnecessarily cumbersome. That said, its short stature means that it’s easier to judge when parking in tight spaces. It’s in the conveniences and electro-governed safety systems where shortcomings creep in. The Holden has handy front and rear parking sensors, but a laughably terrible, grainy and fish-eyed reversing camera. Meanwhile, the Subaru’s camera-based-vision assistance is clearer and has a larger display, but for some reason there are no parking sensors that, for some, represent the primary parking guidance with which cameras support. Each offers collision warning and lane-keeping, and both are prone to over-enthusiastic calibration and glitches. The AEB triggered in both cars in around-town situations where it really wasn’t warranted. The Subaru boasts a slightly superior 7.3L/100km combined consumption against the Holden’s 7.6L, though, predictably, neither matched the boasting in the real world, each hovering around the double-figure mark around town and returning low sevens at the posted limit on the highway. Thanks in so small part to its natural aspiration, the Subaru is happy on 91RON, while the Holden demands a pricier 95RON minimum. While the Subaru looks a little cheaper at the filling station, it starts to look pricey at the dealership’s service division. The Liberty’s servicing intervals are six months/12,500km – twice a year off the road – and the three-year/75,000km capped-price schedule totals $2281.66. Pricey. Meanwhile, the warranty covers three years only, if with no kilometre cap imposed. The Commodore’s usual warranty is more restrictive than the Liberty’s: the same modest three-year surety but with a 100,000km limit. Mileage between services is, at 12,000km, similar to the Subaru, but you only have to service the Holden once per year. It’s also vastly more affordable to service, its capped-priced schedule after three years/36,000km demanding just $817. It’s easy to presume that price-matching a large Commodore against a medium-sized Liberty inevitably trades size for quality and niceties. This turns out to not only be a false presumption, but the outcome of this test proves the absolute opposite. Bar some added convenience from its Liftback format, the Commodore is ostensibly no more spacious or, ahem, commodious by measure of practicality. Kudos to the Liberty, then, for smart packaging that leaves it no less family-friendly to live with. But in terms of more cohesive execution, for better resolve, for a more refined overall character and a more pleasant and effortless driving experience, the Holden is streets ahead no matter what turn the road happens to take. From the vastly friendlier and easier-to-use steering, to the much nicer and comfier seats, there’s a superior quality in the Commodore that just doesn’t clearly translate when viewing the equipment lists alone. The Liberty lays on the window dressing thick, which makes for good first impressions, but isn’t backed up quite as confidently and with as much depth as the Holden in the longer-term experience. Despite the bells and whistles, it’s the fundamental stuff underneath – particularly the powertrain – that negatively impacts on a package feeling increasingly dated. The Commodore triumphs on-road not merely for its surfeit of power and performance, but mostly because of its effortlessness and refinement, it’s near parity cost to run day to day, and its vastly more affordable ownership credentials over time. It’s just a nicer, generally more premium, easier to live with proposition, and as a holistic package represents better all-round value.